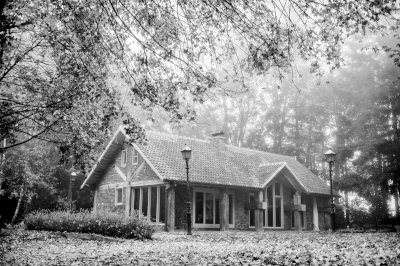 In the early nineties, we - that is Nicole and Eddy Lesage - built our family home in a quiet spot in the Hazebos (The Hares Forest) in Zonnebeke. A bit further on, where the drive ends, was a large overgrown garden hiding a characteristic cottage. When the opportunity arose to buy the place, we jumped at the chance, and so in October 2010 we were able to procure the house and its land. Plunging headlong into the adventure, we planned to renovate the premises with a view to renting out the chalet as a small-scale holiday home. As anyone in the business will understand, the renovations proved much more substantial than we had expected. However, without bragging, we think we may be proud of the result. Perhaps, you wonder why we chose the name Paul's Place. Well, we'd rather tell you personally. So do come and stay!